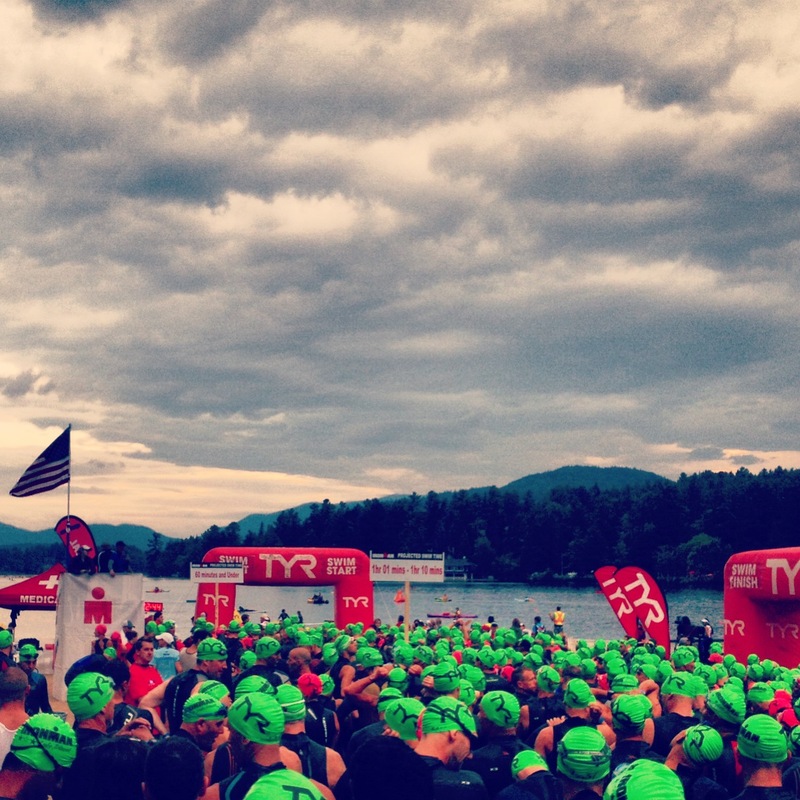 Below is a race report & story surrounding my first Ironman (on July 28th in Lake Placid). I completed the race in 16 hours and 10 minutes, alongside four of my other family members. I’m signed up to do next year’s race too! 2.4 mile swim, 112 mile bike, and a 26.2 mile run. Those in the triathlon world know Ironman as the longest, most grueling distance in the sport – and many outside the triathlon world think it’s the only type of triathlon – and that every Ironman is held in Hawaii. Haha. There’s something special, almost sacred in the swim, bike, and run world about the Ironman distance. I’ve known for a long time that I wanted to complete an Ironman at a young age. I did my first half Iron-distance race at age 14 – I decided kind of on a whim after going to Kona with my dad the previous October (he got in through the lottery and finished!). The atmosphere in Kona was electrifying – and meeting legends like Mark Allen and seeing my dad cross the finish line inspired me to want to hear Mike Reilly chant “YOU ARE AN IRONMAN” for me. Meeting Mark Allen in Kona! I come from a family of triathletes. In fact, in a few weeks at the West Point triathlon, 10 Beggs will be competing. Competing alongside my family has made me love the sport so much more than I ever thought I could – there’s something special about going through the ups and downs, hills, and finish lines with the people closest to you. My dad has done Ironman 8 times, and my uncles each 6 times. My aunt has completed three, and my cousin Erin two. (My brother, along with my other cousins compete in shorter races). I’m the newest addition to the Begg Ironman Finisher club as of July 28th. It was a truly magical feeling to hear “YOU ARE AN IRONMAN” as I crossed the finish Line in the Olympic Oval in Lake Placid. The Begg Family has been racing together since 2005! 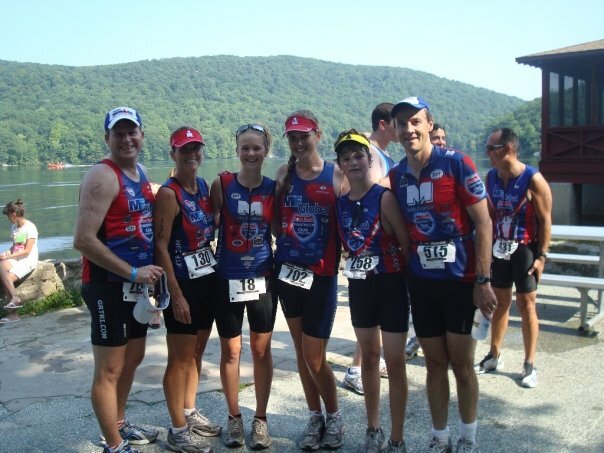 Shown here in 2009 at the West Point Triathlon. After I completed my first half ironman at 14, I always thought that I would do an Ironman AS SOON AS I turned 18. So when the Ironman U.S. Championship was announced early in my junior year of high school (well over a year before the race), set to take place three days after my eighteenth birthday, I was ecstatic to sign up. 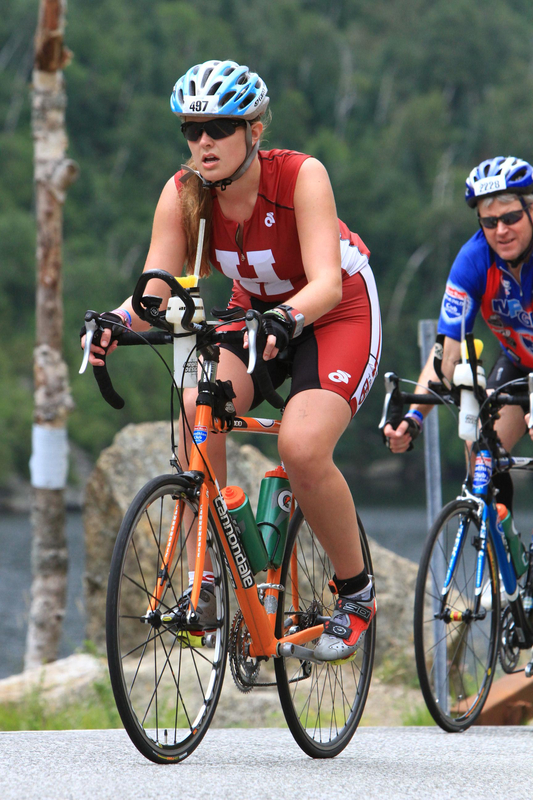 I had always planned on doing club triathlon in college (as it is still not an NCAA sport). I played varsity lacrosse freshman and sophomore year, but decided to quit after my sophomore season to pursue triathlon full-time. 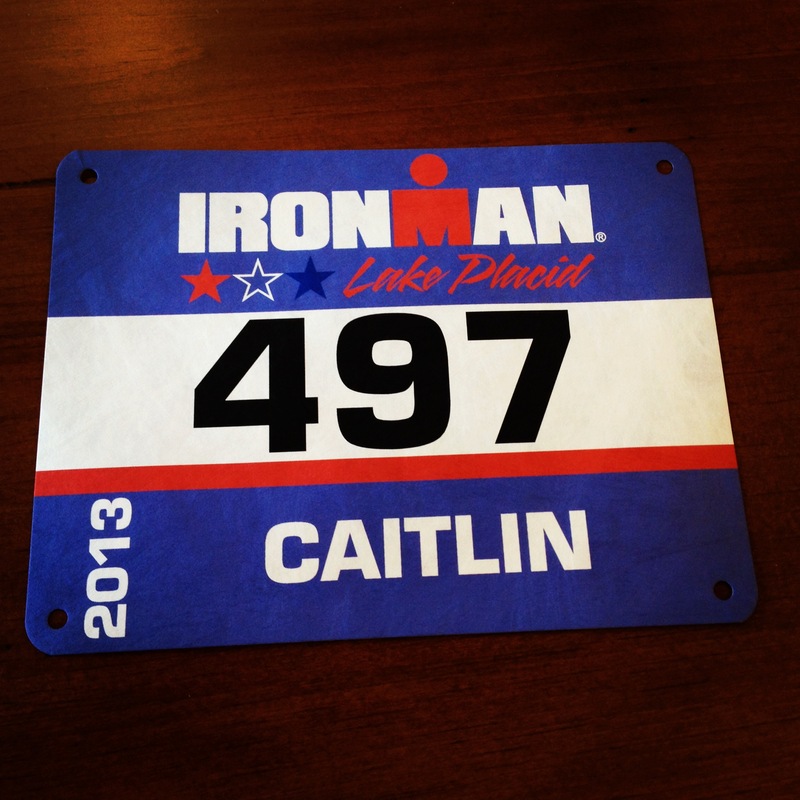 So signing up for Ironman in 2012 seemed like an obvious choice. But, like things often tend to, my plans changed. My life began to take a different (and exciting!) path in September of 2011 at the Westchester Triathlon. After finishing the race, someone approached me. The first thing out of their mouth was something along the lines of “You’re really tall.” Since I’m 6’1-6’2, I get this a lot – so I didn’t think much of it. But then he continued on and started to ask about how my race went and about my triathlon background. After chatting for a few minutes, he asked what my top schools were, as I was a senior. After I told him, he encouraged me to contact the coaches of the schools I had mentioned. He warned that they may not respond – but to try. On the way home from the Westchester triathlon, I couldn’t get the words of the man who had approached me out of my head. I started googling details about college rowing – about the teams of the schools in which I was interested. I had always wanted to be a division 1 athlete – but since triathlon wasn’t an NCAA sport and lacrosse was never really an option at my top choice academic schools, I didn’t think it would be possible. But once I got home, I decided to put together a comprehensive email to the coaches – including all of my athletic (especially triathlon related) stats, extracurriculars, and grades. The next day, and over the course of the next week or so, the coaches responded, and I remember feeling like pinching myself throughout the whole recruiting process – thankful and amazed the whole time that the four schools I had contacted were interested. And SO excited for the possibility of rowing in college. Fast forward to a few months later, and I committed to Harvard. Likely letter in the mail and official acceptance a few months later, I was ecstatic, still in shock, and anxious to head to Cambridge. But I knew that with this amazing opportunity also came a great deal of responsibility. I knew when I committed that I needed to commit myself to learning how to row for a bit instead of focusing on swim, bike, and run. So, that spring and summer, I rowed. And rowed, and rowed, and rowed. And erged. A lot. My times were getting faster, but my technique still wasn’t quite there. And after a stress fracture in mid-summer, I knew that Ironman U.S. Championship was not in the cards. It took a little bit of mourning – but I knew that I was making the smart decision to heal my injury and focus on training for rowing. I owed it to myself – and to my coaches and future teammates – to make sure that I was in the best shape for the fall. Once I’d gotten a bit more used to the sport, I could attack an Ironman. 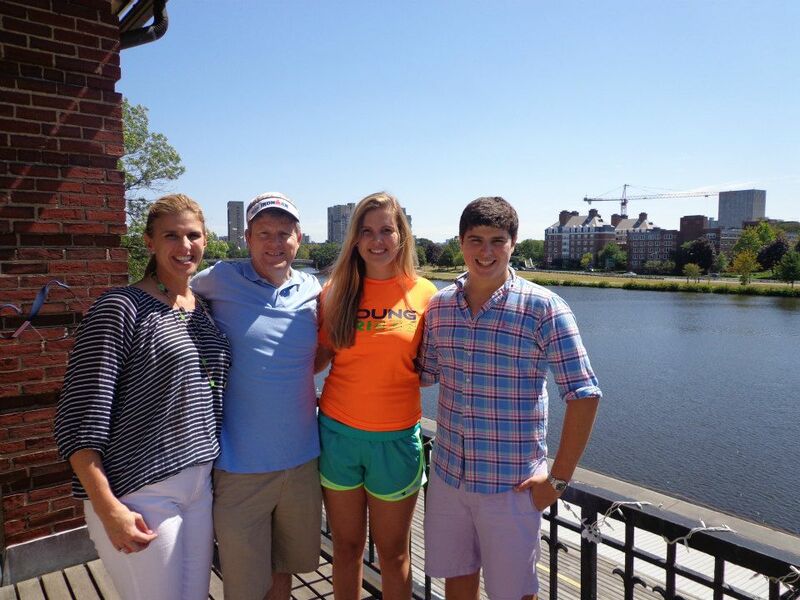 Move-In Day at Harvard – at Weld Boathouse with the family! My freshman year at Harvard was event-filled. I’m thankful every single day for the opportunities that the institution has given me, and for Cambridge, Harvard Yard, the Charles River, “The Game” (Historic Harvard vs. Yale football game each year), my amazing coaches and teammates, and so much more. Weld Boathouse (where I row each day) is spectacular – and I learned so much about the sport of rowing over the last year. However, the year was also quite difficult for me – with some hard and unexpected things happening. Ironman, among other things, seemed out of the question at many points during the year. Harvard definitely took some getting used to – at times I would feel so overwhelmingly inadequate or that I wasn’t “measuring up” to the stereotypical image of a Harvard student. Rowing was my escape – my way of channeling my stress or negative energy into something positive. But it was also very difficult. I constantly felt like I wasn’t good enough; like I wasn’t measuring up to the girls on my team who had gone to nationals, worlds, or who had been rowing for years. Over the course of the year, I began to realize that it was okay to feel what I was feeling. It was completely normal to feel inadequate at times at such an institution – and it was okay that my rowing technique wasn’t perfect – I know that with continual hard work and training that it will come. Since I’m a Division One rower, crew is always my priority at school. I would never, ever skip a workout, practice, or regatta to train for triathlons. However, I do train for tris during the week when I can (sometimes just one run, on other weeks spinning and swimming also) as supplemental training for rowing. It definitely helps improve my fitness for crew. And even though wanting to do an Ironman at 18 was always in the back of my mind, it didn’t cross my mind that it could be possible with rowing and school – especially with the injuries I had throughout the year (shoulder and achilles in the spring). But somewhere along the lines, I felt like it was time. Like I could do it. so I signed up through the Ironman Foundation. And besides a few spins or runs here and there, I knew that my training couldn’t start until the end of May. Which left me less than eight weeks. But I knew in the back of my mind that I could do it. Even though many Ironman competitors dedicate a year (or 6 months, etc.) to training, since I only had about eight weeks I knew that I had to pack in lots of long stuff in order to be able to finish. I didn’t follow any certain training plan, but I focused a lot on being able to make the bike cutoff. My training consisted of going on two century rides with my dad, as well as a bunch of shorter distance rides on the weekends. I also spun inside on the CycleOps a little bit. For swimming, I probably swam a total of 10 times – I swam the 2.4 distance twice, a two miler once, and the rest of the times a mile. In regards to running, I ran seven miles twice and did some three mile runs – but besides that, I didn’t do anything else. I had hurt my achilles in the spring from crew, and since it had just healed and was still sore at times, I didn’t focus much on the run. Training aside, I couldn’t believe it when the day finally came to head to Lake Placid. Counting this summer, I have been to Lake Placid exactly six times – for about a week each summer since 2007 except for 2009. It has always been a magical place for me – the place where I met my best friend Kaitlin, watched my dad complete his first Ironman, was filmed for MTV’s Made for YoungTri, made it into the VIP tent somehow for the final hour of the Ironman finishers coming in, explored random fields in Saranac Lake, wandered around the main part of Lake Placid town barefoot at midnight with my cousins, and so much more. It seemed only fitting that a place with so many positive memories would be the site of my first Ironman. “IronWeek” in Lake Placid is something very special – with athletes walking around in their blue bracelets all week. 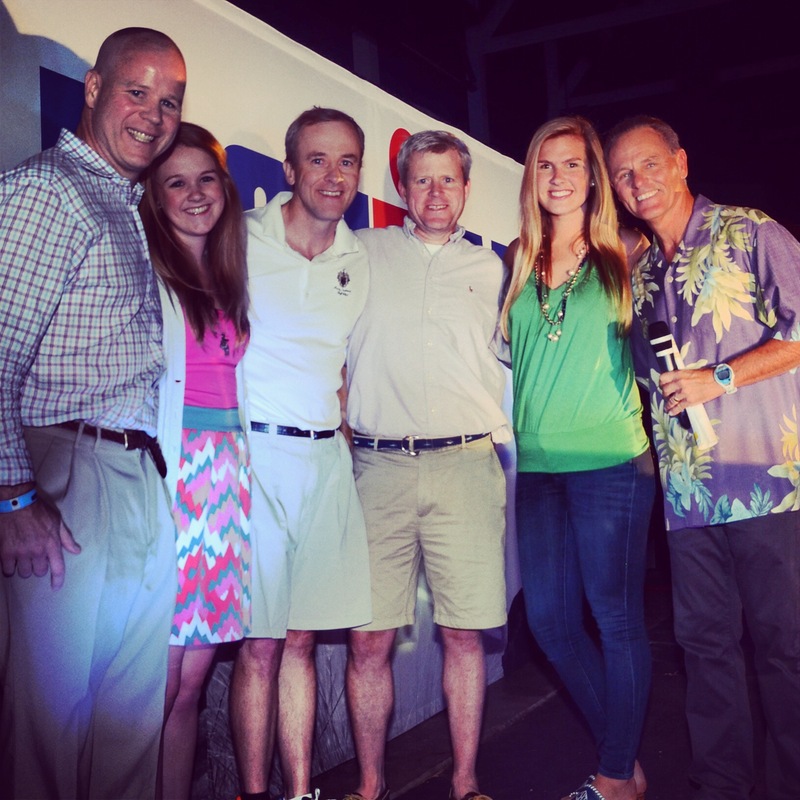 Sharing the week with my family was especially enjoyable – and the other Beggs gave me advice for the race. We headed to one of our favorite spots “Tail O’ The Pup” one night – a fun outdoor restaurant in Lake Placid – where I met fellow 18 year old Ironman hopeful and YoungTri Member Hannah Feinberg (she ended up having a great finish)! It was so much fun to hang out with her and her friends and my family at the restaurant. She will be attending the University of Vermont in the fall, and it was so awesome to connect with another young triathlete – and bond over the sport that we both love so much. The next day was the Ironman Lake Placid athlete dinner at the Lake Placid Olympic Center. Sitting on the exact location where the “Miracle on Ice” happened, I couldn’t help but get emotional for the race ahead of me. I teared up and my blood started pumping – I couldn’t believe that race day was almost here. About halfway through the dinner, after hearing tons of inspirational stories, including that of Derek Fitzgerald who received a heart transplant two years ago and was now attempting Ironman, Mike Reilly “Voice of Ironman” called up the Begg Family to the stage. Adrenaline pumping and nerves running through my body, my family members and I headed onto the stage. Mike introduced my family one by one, and explained how we were the only large family with old and young competitors competing in the race, and even called us the “First Family of Ironman” – haha. It was quite exhilarating to speak in front of thousands of people – I got to speak about rowing, training, and YoungTri, while other family members spoke about their experience with Ironman and how much it meant to compete alongside each other, among other topics. I stepped off the stage feeling even more grateful and excited to race than I had before. The Beggs onstage with Mike Reilly at the IMLP Athlete’s Dinner! Two days later, it was go time. The bike was in transition. The bags were packed. The gear was laid out. I knew I had a long day ahead of me, but I was so excited. My dad and I headed down to the swim start the next morning – nerves running high. After a few quick hugs amongst family members, it was time. I warmed up for about 30 seconds and headed to the start with my dad. When the countdown to my wave (IMLP was a wave start this year) began, my blood started pumping. The adrenaline was kicking in. I felt like I was going to cry. Not so much from being scared – more of being thankful and happy to be at the start line. I looked down at my purple bracelet, with the words “Practice Aloha” etched on them, and was excited to start the race. Looking around at the thousands of spectators and green and pink caps, it was hard to believe that the day was finally here. July 28th. It was time to become an Ironman. Before I knew it, the gun went off and I ran into the water. I clicked my watch, and giggled to myself knowing after taking the first stroke at how long I would be out on the course – but hey, as the cliché saying goes, 140.6 starts with a single stroke! Haha. My dad and I ended up (somehow) sticking together throughout the swim, and the buoys in the water (numbered 1-9) definitely helped pace the swim. I was kicked a decent amount – but nothing too terrible. I came out of the water in 1:19, and headed to transition. I saw my family members screaming as I ran into T1, which gave me an extra boost going into the bike. The Lake Placid bike course is the most beautiful course on which I have ever competed – with myriad scenic twists and turns, it is hard to not appreciate the region’s beauty while cycling. However, it is also very hilly. Almost immediately after heading out on the course, I knew that it was going to be a very difficult ride. My dad rode a little bit behind, and it was nice having someone there during my Ironman journey. He has always been the most supportive person through my triathlon endeavors – and I was so lucky to have him with me throughout the day. It’s hard to believe that he’s already done eight Ironmans (including Kona twice)! Pretty soon into the ride, I started to have intense stomach pain. It lasted from mile ten to mile 90. I’m still not exactly sure what it was from, but it did make the ride seem a lot longer than usual. I have had IBS for a number of years now, and am on a strict Gluten and Dairy free diet, but I still have stomach pain often. Stomach pain aside, I made sure to focus on the road ahead of me and making the bike cutoff. I would focus on the next five miles, the next ten, or even the next mile – in order to distract my brain from the fact that I still had quite a few hours left on the course. Coming to the end of each loop, the “three bears” – consisting of hills called Mama Bear, Papa Bear, and Baby Bear, were lined with a ton of spectators – giving me the extra boost I needed to finish! I made the cutoff by 45 or so minutes I believe, with a time of 8:24. Heading out to the run, I had an extra boost of energy – and started out strong. The beginning of the run came easily – I breezed through the first half marathon with a pretty solid time. Come the second half, however, I began to feel sick. And not myself. I knew that it wasn’t worth risking “bonking” to get a better time at this point. So I looked at my watch, calculated how much time I had left, and kept pushing on towards the finish. What kept me going throughout the race – especially at my low points – were the people constantly yelling “Go Harvard” or “Go YoungTri” at me on the course. Lots of people remembered me (and my family members) from the athlete’s dinner which was so exciting! It was so cool to meet people from Instagram and from the dinner on the course – it made getting through the day that much more fun! I made a few friends on the course – and ran with a girl from Northeastern (she was a swimmer and it was her first Ironman too), along with quite a few others. That’s another part of the Ironman experience that I enjoyed so much – meeting so many amazing people on (and off) the course. Post-race with my brother TJ! Quick pic on the course with Erin! Through the final hours, and “pre-midnight miles” – the miles in the pitch black – I could feel the finish line inching closer and closer. My dad caught up to me at about mile 20, and he helped pace me to the finish. Each mile at this point seemed like an eternity. It was a world of a difference from a few hours before with tons of competitors and spectators around in broad daylight. As we approached the final 5k – with a large chunk of time to spare – I knew that I could finally become an Ironman if I paced myself and stayed mentally strong. My body felt like it was about to collapse – but I was so close. It’s funny, because normally a 5k feels like nothing – a 21 minute run or so – but the last 5k took me about 45 minutes (lol). My feet shuffling, body drenched with sweat, and my mind tired from the long day, I began the loop around Mirror Lake to finish my Ironman journey. With people on the sideline screaming “Go Harvard!” and “Go Caity!” with a mile left, my blood began to pump a little bit faster. My dad and I looked at each other and smiled. It was going to happen. After what seemed like the longest mile ever, my dad and I headed into the Olympic oval. Running down the finish line, I saw my family members on the side screaming with huge smiles on their faces. And, a few steps later, Mike Reilly chanted “Caitlin Begg, Harvard Sophomore, YOU ARE AN IRONMAN!” My official time was 16:10. My cousin Erin (who had already finished) was waiting with a huge smile (and bear hug) at the finish line as soon as I came through. The huge smile on her face got me choked up – and reminded me how much I love sharing the sport with my family. The soreness set in pretty quickly, and after taking finisher pictures (after cheering on my Uncle Billy at the finish!) and drinking some water, I sat down over to the side of the finish line on the grass to eat and chill with the rest of the Beggs. I was so thankful for all of them for watching, and especially to my dad for sticking with me! I was also SO thankful for all of the volunteers and the help they gave me and the other competitors throughout the day. My brother TJ (Iron Spectator himself), handed me my phone a little later – with tons of messages from supportive friends. (How was I without my phone for 16 hours?!). My mom had even come to the finish line with all of my favorite Dairy and Gluten free snacks! Kaitlin had even been tracking me ALL day – and had been tweeting and texting others updates! (So did YT Ambassador Brittany, which was so nice!) I’m so thankful to have such supportive family members and friends. 16:10 was my official time – finally crossed the finish line! Especially with Ironman, my motto for long races (along with most of my family members) has always been why not? 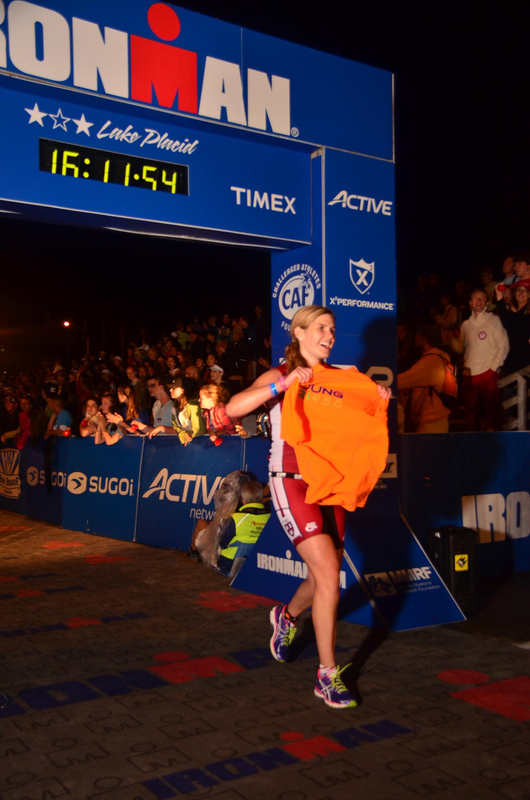 It’s not amazing that myself or my cousin Erin completed an Ironman at 18. We just stuck to a plan, and followed our hearts to complete a goal. I’ve learned (especially) over the past year to take things in stride — to not obsess over the little things, and to appreciate things in the bigger picture (and the small things as they come, of course). Finishing my first Ironman was representative of this. There was nothing like crossing the finish line and hearing Mike Reilly call my name, and it was even more magical to stay until midnight and see the final finishers come through – with my family and I dancing alongside thousands of others along the edge of the finisher chute. So, what am I really trying to say? Go for it. For me, finishing my first Ironman on July 28th was representative of overcoming some of the things from the past year as well as completing a lifelong goal. And I’m so excited to attack the race again next year and improve and enjoy the experience even more. And what’s next for me? Right now, focusing on rowing. I’ve been back on the erg, excited for the season to come :). My advice? If you want to do an Ironman, SIGN UP. If you want to try a triathlon, commit to it. Do it. I’ve learned a lot over the past decade in the sport of triathlon – one of the most important lessons being that DONE IS BETTER THAN PERFECT. Saying that you’ll do an Ironman or that next big race in 5 or 10 years is great, but why not now? What’s stopping you?